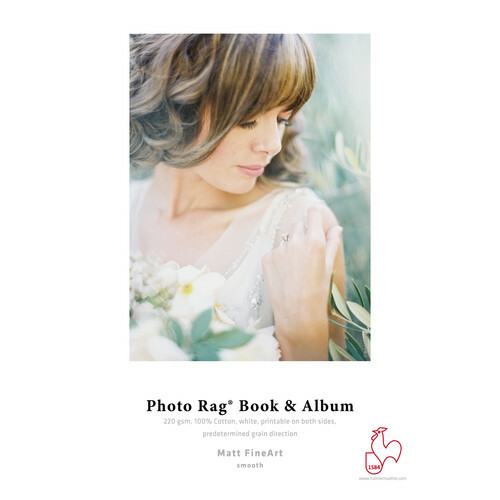 Sheet Size: 26.1 x 36.2"
11 x 17" 13 x 19" 17 x 22"
26.1 x 36.2" 8.5 x 11"
Create fabulous books with vivid and sharp prints by using double-sided Photo Rag Book & Album Paper from Hahnemuhle which has a smooth matte surface. This 50-pack of 26.1 x 36.2" sheets features a short grain, which need to be bound on the short side for smooth page turns. The paper itself is made from 100% cotton rag and has a weight of 220 gsm, ensuring a premium feel and durability. It measures 13 mil thick and features an opacity of 99% and a whiteness of 92.5%, which is achieved through the use of a minimal amount of OBA content. Additionally, it is acid free and calcium carbonate buffered for longevity and is instant drying and has a high water resistance. Box Dimensions (LxWxH) 37.0 x 27.0 x 1.5"